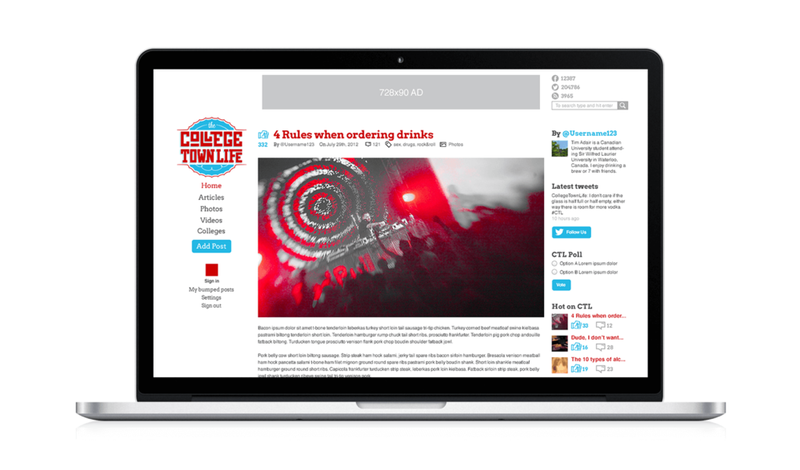 The College Town Life was a social content publishing site focusing on college students with an online presence of over 500K twitter followers. I redesigned their brand identity to fit their informal message & audience and to allow physical applications. The clients gave a lot of freedom for the brand, their only direction was to keep some part of their previous bottle cap symbol that they loved. I opted for a vibrant variant of "the national colors", and custom lettered slab serifs which are a staple of many college brands. Afterwards, I redesigned the site which lead to extending the brand to UI and icons. The most interesting of these was finding an analog for "thumbs up" that fit the brand. We chose the "fist bump". I designed the icon set to fit the sharp edge visuals of the logo.